Even after years of planning and months of warning, some bicyclists seemed surprised to find the Springwater Corridor Trail through Oaks Bottom closed On July 9, as the Oaks "Bottom Habitat Enhancement Project" began. 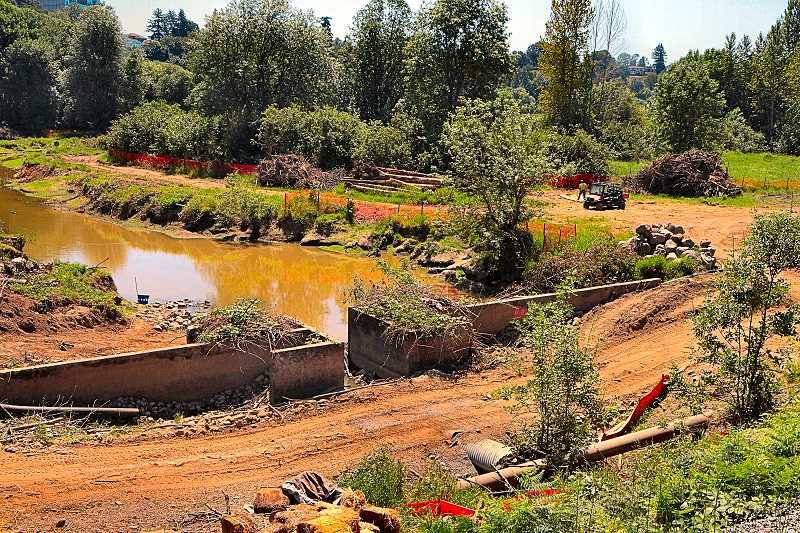 It will restore year-'round circulation between the Willamette River and the Oaks Bottom Lagoon, which will make the pond available for young migrating salmon, and should also better control mosquitoes in the vicinity of Oaks Bottom. A giant dump truck and a large excavator were parked on the trail when THE BEE visited the construction site on July 17. "Before the project began, we conducted a mussel salvage; and the first week of July, we conducted a fish salvage – and relocated any remaining wildlife in the work area," remarked Portland B.E.S. Environmental Program Coordinator Ronda Fast. "We worked with the Xerxes Society of Portland to recover more than 250 native freshwater mussels that we are temporarily storing in the Columbia Slough, until we can bring them back here." Unexpected preparatory work occurred when crews unearthed an abandoned natural gas pipeline segment. "It was filled with some kind of sludge, so we froze the pipe with liquid nitrogen, and then capped it until we could pump the contents into containers for safe disposal," reported LKE Corporation Lead Ecologist (and President) Kim Erion. "At night, we park all of our machines over felt pads, and all of our equipment sits in containment ponds, so if there is any kind of a spill there would be no residual drips contaminating the soil in our work area," Erion said. To date, the project is on schedule, confirmed Army Corps of Engineers Project Manager Jim Adams. "So far, we've been making preparations for the major and most complex component of the project: Cutting a 'notch' in the [levee] berm to remove the old culvert, put in new footings, and install the new larger culvert and backfill it – all in one month!" But before any of this work took place, a crew from Richard Samuel's Oregon Pacific Railroad had to cut and remove their tracks over the culvert area; those will be among the first parts of the rebuilt berm to be reinstalled. In the meantime, Samuels is helping convey equipment and other materials into and out of the work area, right up to the point where his rails temporarily end. Remember, the pedestrian and bicycle trail through Oaks Bottom remains closed until Hallowe'en. 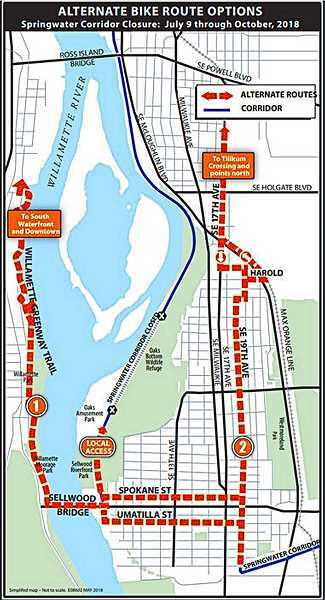 The city has completed the planned work to create a detour bicycle route from the south end of Sellwood, to the north end of Westmoreland at S.E. Mitchell Street. Most of the way it runs on 19th Avenue – removing stop signs that would impede bicyclists, and adding special signage and street markings, and in a few cases, adding bike lanes. Motorists and bicyclists are advised to be careful and watch out for each other.